Being in Bodrum is always lovely but for this visit, rather than just heading on home, we decided to make a little detour and extend our break by a couple of nights. And the Datça Peninsula is always a great choice! 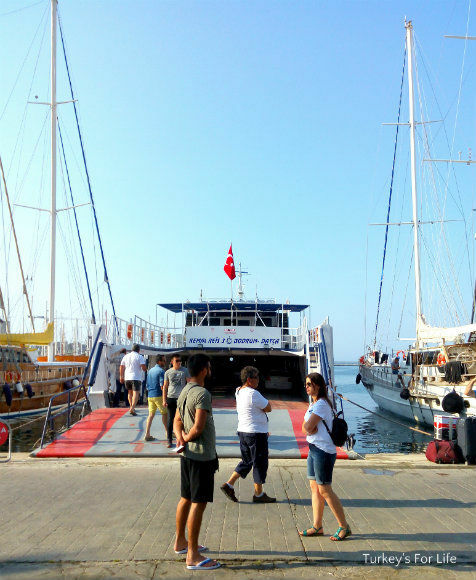 We’ve wanted to use the Bodrum Datça ferry for some time, but, because of the time of year when we’re in town, the ferry hadn’t been running on convenient days. Happy days for this year, though. We checked the timetable on the off chance. 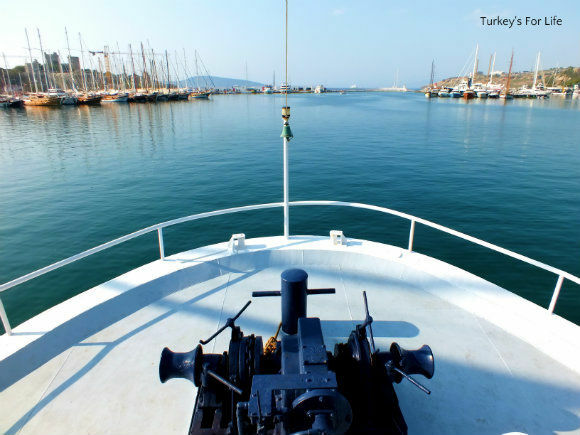 We were planning to leave Bodrum on the Tuesday…and there was a ferry to Datça on the Tuesday. Surely an opportunity that we couldn’t allow to pass us by. Leaving one pretty postcard town to arrive in another – and we’re doing it by sea! It was the beginning of May. We were told we didn’t need to prebook; just arrive on the morning. Unlike the trip from Bodrum to Kos, this was going to be a journey from one Turkish town to another so no need to get passports stamped. A few people were milling around, cars were queuing to get their parking spot on the ferry and we paid for our ticket and climbed to the top deck to take a seat in the morning sun. Isn’t this just the best bit about travel? That anticipation and little bit of excitement about what lies ahead. We’d walked from our pension and along the harbour on a beautiful, still morning. Gülets lining the harbour wall and the constant backdrop of the castle. The ferry was waiting. And yeah, we’d been to Datça before – but never like this. A 105 minute sail along the Aegean was to come. Perfectly still, calm waters in the protection of the harbour. We’d looked at the map the ferry takes and saw potential for choppy seas once we got out into the open. No fear, however. I was relieved to see a sturdy car ferry in the Kemal Reis. This is no flimsy pleasure craft. It’s built for a purpose and it’s fit for purpose. 9:30am and the engines were purring and the anchor lifted. We were off; heading towards the harbour exit and on our way to the beautiful Datça Peninsula to the south east. There were passengers like us; using the ferry as a pleasant way to move on to elsewhere, to take a holiday or to continue ongoing travels. And there were those in their cars and on motorbikes, using the ferry as a convenience. An as-the-crow-flies trip across the sea from one Turkish peninsula to another. Rather that than the longer road journey. Some of these people had no doubt done this journey numerous times. They headed to the inside seating area and went to sleep! None of that for us. This was new and exciting for us – our own little mini adventure! And yeah, we could have used the Muğla minibus network to go to Datça. Bodrum to Marmaris and then a change and onwards to Datça town. But if it’s a choice between two minibuses with a couple of backpacks and one ferry that’s gonna sail across part of the Aegean Sea on a sunny spring day. No comparison on this occasion. Gülets and yachts shared the sea with us for the early part of the journey. We could see the Bodrum Kos ferry heading off in the distance. 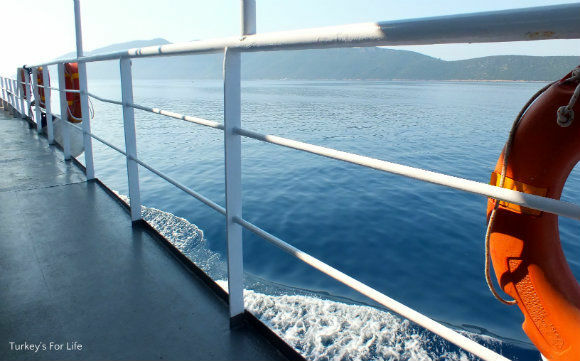 Our ferry turned eastwards, hugging the Bodrum Peninsula coastline for a while before heading towards more open waters. 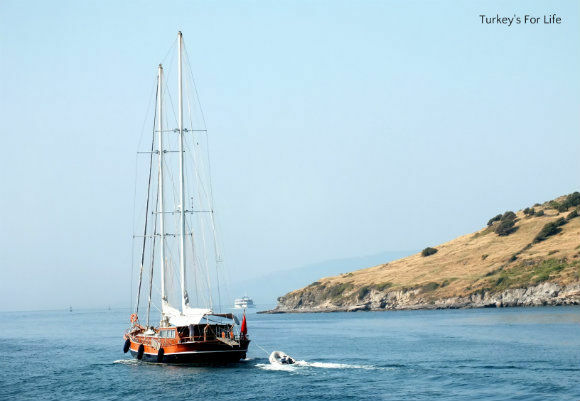 And those open waters were on their wonderful best behaviour on the day we made the corssing between Bodrum and Datça. Hardly a ripple across the surface. Strange to think we can sail to various Greek islands – Rhodes from Fethiye, Meis (Kastellorizo) from Kaş, Kos from Bodrum – quicker than we can sail between two towns in the same country. No complaints though. The snack bar was open. 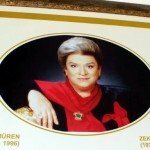 Turkish coffee, çay and simits were delivered to various customers. We took photos and breathed in the fresh clear air. Barry looked online for accommodation in Datça as we sailed along. That’s another joy of travelling early season. No pressure to plan and book well in advance. We browsed a few photos and reviews and chose while we were en route, finally picking out the lovely Fora Apart Hotel. And eventually, the more rugged coastline of the Datça Peninsula came into view. This is Carian Trail territory. We’ll walk those hills one day. 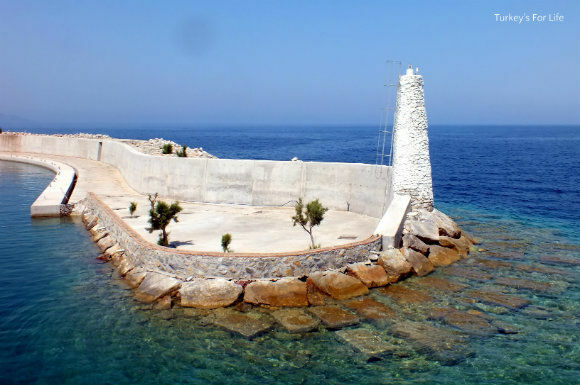 For this particular journey, however, we were admiring the hills from a distance, heading towards the lighthouse and entrance of Kairos Marina. An almost deserted Kairos Marina awaited us – and a bus in the distance. Kairos Marina is on the opposite side of the peninsula to Datça Town. Our ferry price included a trip on the shuttle bus to take us to the town centre. Out of season, the Bodrum Datça ferry (and vice versa) runs a few times a week. In high season, there are multiple daily crossings. We didn’t need to prebook our crossing but it might be advisable to prebook at busier times, especially if you have a vehicle with you. In May 2018, we paid 50 TL per person, one way, as foot passengers. It is also possible to book return crossings. On arrival in Datça, a shuttle bus takes you to the town centre. This is included in the price and the journey takes 15-20 minutes. 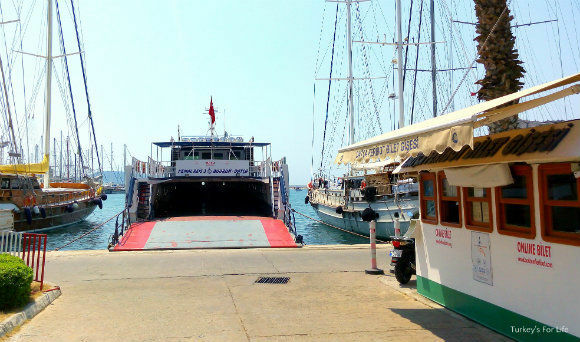 The Bodrum Datça ferry officially takes 105 minutes but it was more like two hours once anchoring had taken place. 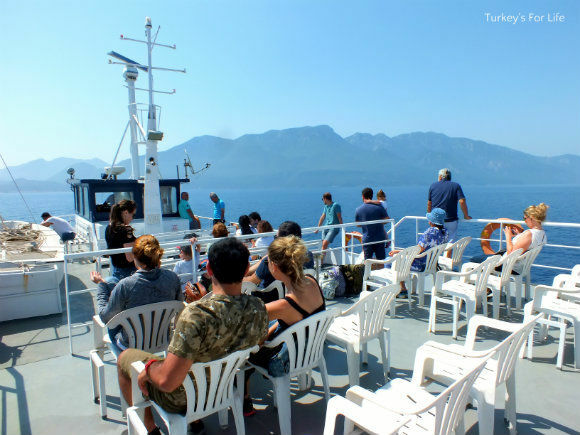 The ferry we were on (Kemal Reis) had top deck seating in the sun as well as shaded outdoor seating below and indoor seating, too. There is a snack bar and toilets. 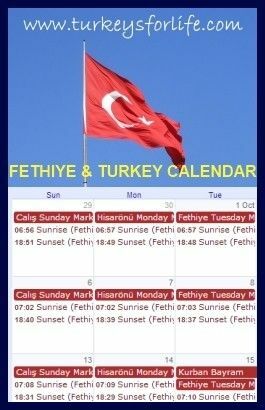 The full timetable for the Bodrum Datça ferry – and other ferry crossings in the area – can be viewed here. You can book accommodation in both Bodrum and Datça online through Booking.com. I must find out if dogs are allowed on the shuttle bus. I could take the car but it is much more expensive. And we need to start asking about whether places accept dogs for you! 🙂 Yeah, sure Jake would be fine on the ferry to Datça but not sure what would happen at the other side.